Whenever I mention my orchids to people, even plant-lovers like me, they almost always say, “oh, I can’t grow orchids.” But you can! Orchids are just plants, and like all plants, they need light, water, and a little attention. If you’ve ever brought an orchid home only to have it die on you, don’t feel bad – the deck was stacked against you. It takes years for a young (usually cloned) orchid to get to blooming size. That means the plant has been living its whole life in nearly perfect conditions. Growers know what they’re doing, after all. Most orchids won’t sell when they’re not in flower, so the plants are grown until they bloom, then they’re shipped to stores. The blooming process puts stress on the plant to begin with. Add to that the enormous stress of being thrust out into the world, put in a less-than-ideal environment for the first time, sitting in a store getting poked at, and then finally coming home with you. It’s no wonder people think orchids always die the moment you bring them home. But it doesn’t have to be that way! Here are a few tips I’ve learned for buying and caring for orchids. 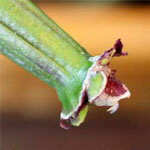 Buy plants that are “in spike,” meaning they’ve started the blooming process, but have not yet opened a flower. This way you’ll get the plant into a good spot before the major blooming stress (good for the plant), and you’ll get to see the whole blooming process (good for you). Plants bought with a stalk full of open flowers may keep them for a little while, but you’ve already missed half the fun. Do you have to mist? Not really. Some say it helps increase air humidity, which orchids do like. But a better way to increase humidity is to use a humidity tray. Just place a wide dish below the plant and fill it with some rocks (to raise the pot out of the water) and then fill it with water. The water then evaporates up, humidifying the plant all day. If your bathroom gets good light, try an orchid in there! They’ll love the humidity. Do you have to feed them? Occasionally. 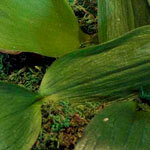 I use Norman’s Optimal Orchid Nutrients once a month or so. 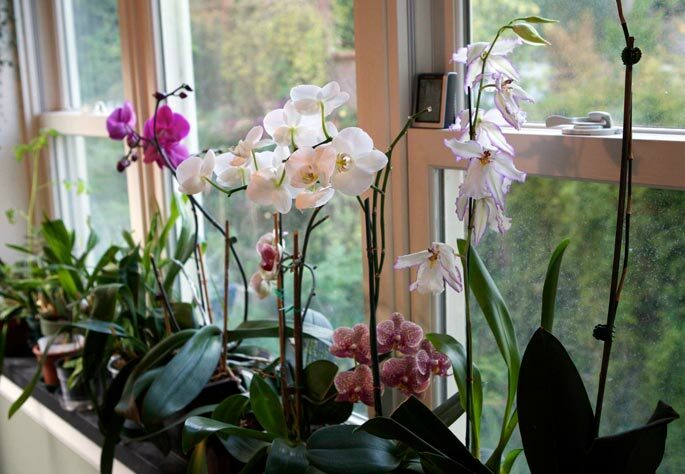 Different kinds of orchids require different amounts of feeding, and even the same plant will need more or less nutrients depending on the season (generally more in summer, less in winter). Overfeeding can be worse than not feeding at all, so be conservative. Finally, remember that orchids are as diverse as the plant kingdom itself. Some like bright light, some like barely any. Some grow in sand, some like moss. They’re all different. I find Phalaenopsis particularly easy to care for, so I’d suggest starting there. But no matter what you get, remember there are people out here who want to help! So find out the name of yours, pop it into Google, and see what you learn. You’ll be amazed by how much info is out there. That’s all I’ve got (and far more than I had when I started). Give it a try! If you have any questions, feel free to ask me on Twitter. 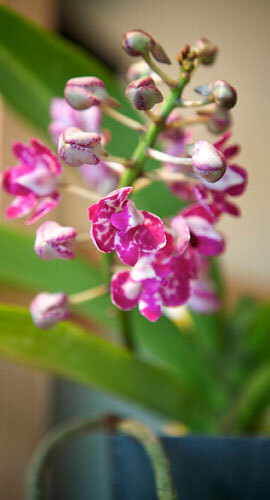 Update: Jodi DeLong has a great post on growing Phalaenopsis orchids.